Hands down, boots are the most versatile shoe style—ever. There are thousands of different combinations to choose from (color, material, length), and they truly look good with anything from dresses to trousers. Although I’m a proponent of wearing them year-round, boots truly get their chance to shine once fall begins. Considering that it’s now October (seriously, how did that happen? 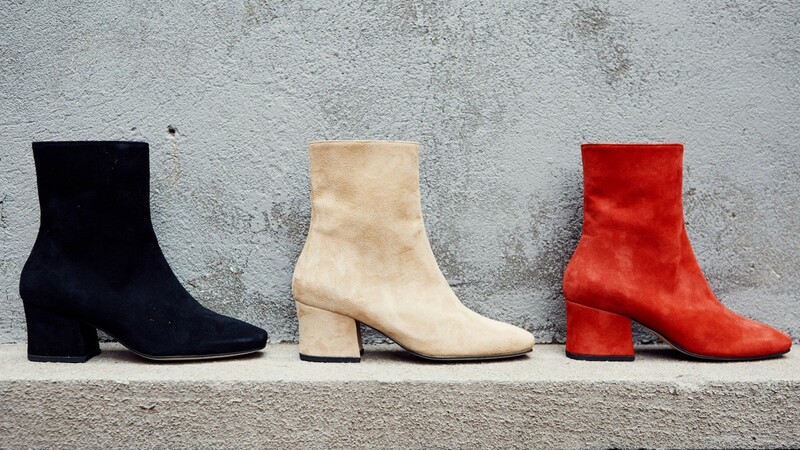 ), we’re in prime boot season—especially for heeled booties, otherwise known as the MVP of your cool-weather wardrobe. Although I could happily wear the Givenchy Prue Buckle Bootie every day of my damn life, don’t we all want a few gratuitous inches of height? Thought so. Check out the 21 pairs of heeled boots our editors are scooping up for fall. 1. LOQ Lazaro Boots: Sometimes you need a boot that you can throw on every day and always feel like a million bucks. For me, that’s this LOQ pair in dark olive green. The blocky heel and buttery leather will make even my most casual jeans-and-sweater combo feel special. 2. Maison Margiela Tabi Boots: I’ve wanted Tabi boots for YEARS, ever since I saw them on an editor at my first fashion internship. The unique shape is inspired by the Japanese tradition of wearing socks with thongs (the shoes, not the underwear), which also happened to be a major trend on the NYFW runways this season. 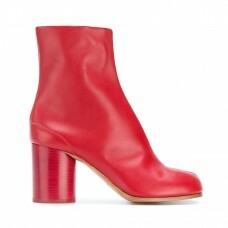 Statement red, come to Mama. 3. Proenza Schouler Platform Boot: I can’t help it—I absolutely love a platform boot. Even better if it’s in stunning python. 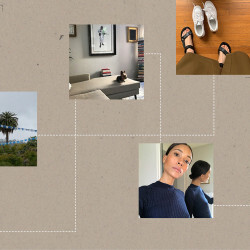 All I need is a leather bomber, cropped trousers, and my favorite sunnies, and I’ve got a street-style-worthy outfit to last me until spring. 1. By Far Becca Suede Ankle Boot: I think these boots give off a very cool, very French-girl Saturday-morning-in-Le-Marais vibe. The lace up details are delicate, pairing well with trousers and soft sweaters. 2. 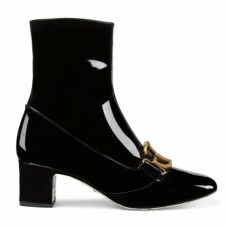 Gucci Fringed Logo-Embellished Suede Ankle Boots: I’m more of a suede gal then a patent leather chick, so these boots definitely lean into my taste. The fringe style with the GG logo gives them a loafer feel that I’m down to pair with my baggy boyfriend blazers and mom jeans. 3. Ganni Marlyn Leather Cowboy Boots: I’m currently having a moment with Ganni, and these cowboy boots really took our relationship to the next level. And they’re PINK! How could anyone say no to them? 1. Yuul Yie Leather Ankle Boots: Sure, I could reach for the standard black boot, but aren’t a creamy pair of tan boots with a colorful block heel so much more fun? 2. Chloé Rylee Snack Effect Ankle Boots: Confession: I already own two other pairs of snakeskin-effect boots. I have them as such an essential part of my heavy rotation, I can’t help but add to the collection. 3. Sophia Webster Lorena Crystal Sock Boots: Sometimes you need a pair of boots with some harness-style bling, right? 1. Stuart Weitzman Veruka Bootie: Of all the things to love about these—the patchwork, the laces, the chunky-yet-walkable heel—I’m most taken by the blue-grey color, which is gorgeous and totally unexpected. 2. Christian Louboutin Moulamax Bootie: I don’t own a pair of Louboutins (yet), but the more I look at this goes-with-everything suede pair, the more I think they’ll be my first ones. 3. Tamara Mellon Icon Ankle 75: I bought a pair of white booties last fall, and they quickly became my favorite, which means I need another pair in a different style. I love the slouch on these and would wear them with a short skirt and a sweater. 1. Calvin Klein Chris Metal Toe-Cap Boots: This fall I’m striving for a “cowgirl meets the city” vibe, in every aspect of my life. From cooking my own vegan chili to wearing maxi dresses with cowboy boots, I’m trying to play this one out until I’m actually mistaken for one. 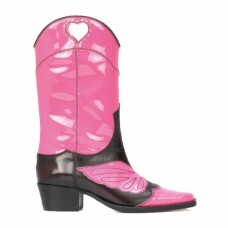 These Western boots are perfect for when I want to wear something more casual and upgrade it a bit. The metal toe-cap detail on this is such a small but perfect detail to a simple boot. 2. Dear Frances Spirit Boot in Black Croc: These boots have been on my wish list since last fall, and for a good reason. These are a true fall/winter staple and also come in all colors/textures. I love that these block heels are a perfect height AND are so comfortable to walk in all day. What’s not to like? 3. 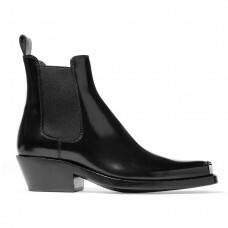 French Connection Mary Stretch Neoprene ankle boots: If you’re looking for a good heel for any occasion, these ankle boots will give you the versatility you need! I love how easy and classic these booties are; I’m def making it a fall/winter staple. My feet tend to swell up a lot towards the end of the day, so I love how stretchy and breathable the fabric is on this one. I’d pair these with a nice cropped jean, or even a denim skirt with a chunky knit sweater tucked in. Is it obvious I’ve been planning my fall outfits for a while? 1. Anine Bing Chloe Boot: I lose it for the ties at the top of this bootie with the little string detail and the tight-fit material that erases any suspicion of cankles. 2. Gray Matters Zattera Ankle Boot: I’m sorry, but do you really expect me to spend the rest of my life without marbleized turquoise cubes under my feet? 3. Acne Ankle Boot in Jade: The designers may call it jade, but this color—which I’ve decided will be a new neutral in my wardrobe—makes me think of rusted copper, the original art deco bathroom tiles in homes in L.A., and how damn good these will look with a camel coat. 1. 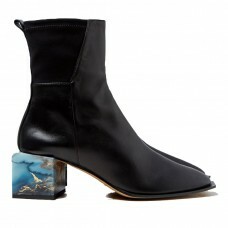 Gucci Victoire 55mm Patent Leather Bootie: Shout out to Gucci for making the simple black bootie chic. The patent leather gives you the perfect texture for the winter, and the GG buckle on the front is logo mania at its finest. 2. Reike Nen White 80 Square Toe Ankle Boots: Completely ditching the “no white after Labor Day” rule for these structured booties. 3. 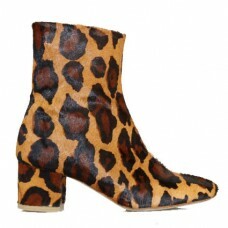 Brother Vellies Leopard Kaya Boot: Considering animal print is in this season, these leopard booties are right on trend. The real calf hair on the outside of the boot will keep your feet super warm for this upcoming winter.